At only fourteen-years-old, Hannah McCann’s high school experience has been nothing but traumatic. Not only did she suffer through relentless bullying in her first year, but the first anniversary of her sister’s death is also approaching, and Hannah’s world is beginning to fall apart all over again. Her mother is still severely depressed, her father is physically crippled from the accident that killed her sister, and, although the bullying has finally stopped, Hannah is still a loner with no one to turn to but the school counsellor. Before starting secondary school, Hannah was happy. She was on the swimming squad, and was good enough to compete in regional and state events (and once even nationals). She had a best friend named Charlotte who she did everything with, and besides maths and PE, excelled in all of her school subjects (a trend that continued on throughout her school career). It wasn’t until starting Year Seven that everything turned into a nightmare. Shunned by the popular girls from day one, abandoned by her best friend after a short period of time, and with the bullying from her peers gradually increasing from taunts to fruit-throwing, and from derogatory Facebook pages to bag stealing, Hannah struggled to deal with the daily abuse. Alone in the school yard, she couldn’t even rely on her older sister Katie to help her out- wanting to avoid the social backlash of being associated with Hannah, Katie would rather dispense ‘advice’ from the sanctuary of home than be seen in public with the school pariah. Accused of being ‘too needy’ and ‘too much of a try-hard’, Hannah didn’t think that things could get any worse. Then came the accident that changed everything. Hannah, Katie and their father were driving to school when a truck slammed into them- killing Katie and severely injuring their dad. All at once, the school taunts stopped, the school grieving process for a lost student began, and Hannah was left to deal with all of her psychological issues alone. This story is both charming and tragic- the grief that Hannah and her family feel at the loss of Katie is overwhelming, as is the heartbreak that you feel for Hannah at the hands of her bullies. But there is also an undercurrent of hope and authenticity that flows through the pages, as Hannah tries to rise above her situation. 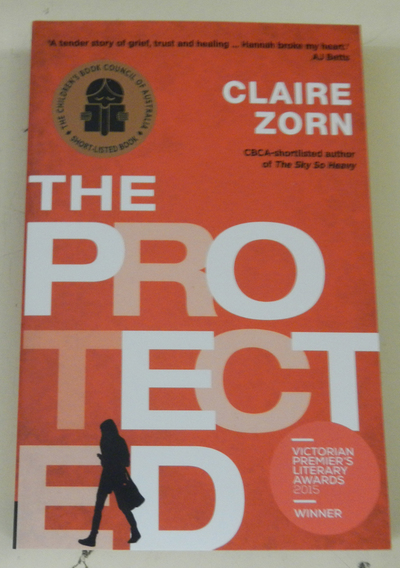 Short-listed for The Children’s Book Council of Australia, The Protected deals with multiple issues, including grief and bullying, all of which are carefully observed through the eyes of a teenage girl. Hannah talks about Katie as she was (rather than put her on a pedestal as most people tend to do with those who die tragically young), and isn’t afraid to list her faults as a sister and daughter. But she also appreciates the good sides to her sister and shares those equally with the reader. Her relationships with her parents, neighbour, grandmother, and the people at school are just as open, and show how complicated and fragile life can be between certain people. Skipping between the ‘before’ and ‘after’ of Katie’s death, readers see everything from Hannah’s perspective, experience life as she does, and get an insight into a world full of grief, guilt and occasional humour. This is a thoroughly honest (and sometimes uncomfortable) novel, but well worth reading.